Few days ago my outfit was like this- simple black men shirt with added strong shoulders, sleeveless hoodie and a denim shirt tied around the waist, The Shirt tied around the waist is a 90's staple and for me it represent everything about the underground style, the hoodie as well, it is kinda like a typical piece for a rapper- hip-hop culture- look! For this kind of outfit there was no better place to shoot it then the rusty abandoned parking lot at the end of the city which we came across after hours of sightseeing the whole city of Trieste, Italy. Awesome look, babe! I love the pants! Such a cool outfit! 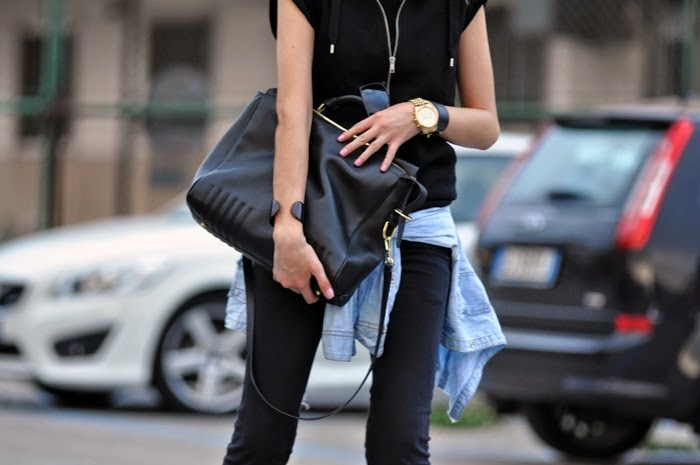 Love your trousers and the denim jacket wrapped around the hips.